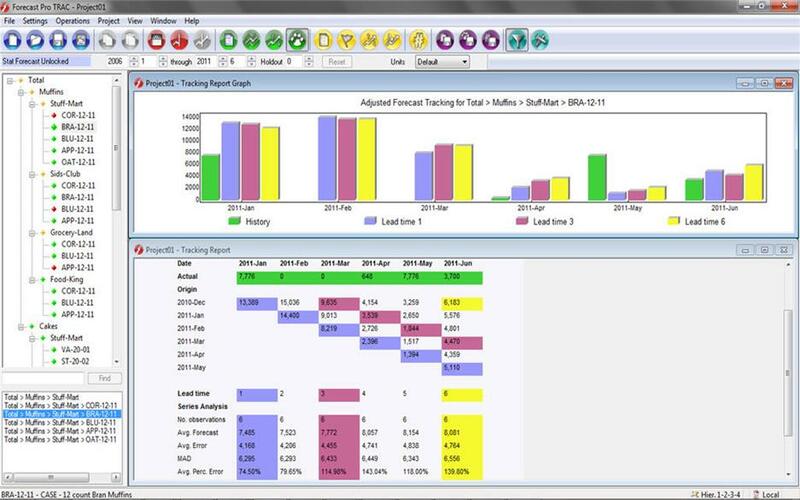 Forecast Pro’s comprehensive methods accommodate seasonal demand, product hierarchies, product promotions, new products, slow-moving items, causal variables, outliers and much more. Forecast Pro makes it easy to collaborate with others to establish the final forecast. Members of your team can add their business judgment directly using the software's spreadsheet-style override facility, which features up to ten customizable rows. 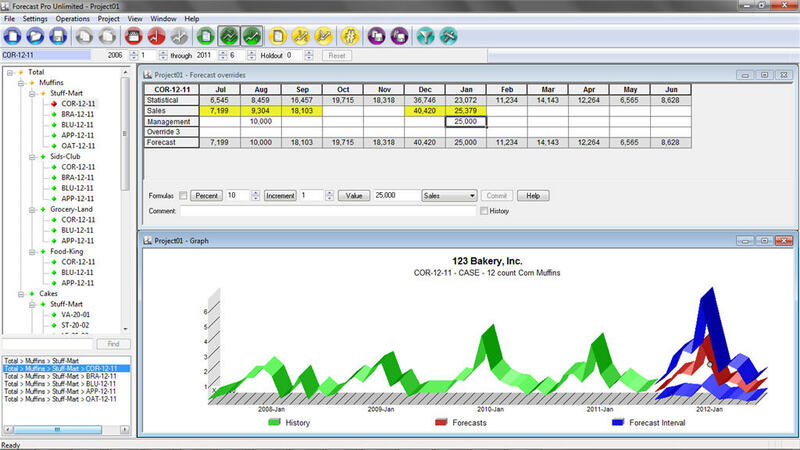 You can adjust single points, ranges or totals, using percentages, increments or by simply entering new values. Adjustments to the forecast can be made at any level in the hierarchy, and all changes are automatically reconciled. Handy comment fields make it easy to document changes, and override reports provide transparency to the process. 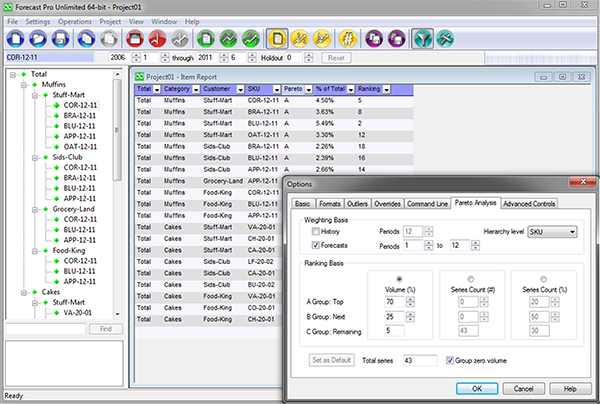 With Forecast Pro’s powerful "shuffling" capability, you can rearrange hierarchies on the fly. For example, you may be working on your forecast in a product-by-customer view and then instantly change views to work with customer-level forecasts broken out by products. Using the powerful combination of Pareto analysis (ABC classifications) and report filtering, you can streamline your forecast review process and save time. Forecast Pro's automated Pareto analysis gives you the flexibility to assign ABC classifications to the items you are forecasting in a number of ways based on volume (either historical or forecasted) or series count. Further, you determine at which level of the hierarchy to assign ABC classifications and which periods to analyze. Forecast Pro maintains an archive of your previous forecasts (both statistically–generated and adjusted forecasts) so that you can compare and contrast previous forecasts to what actually happened. 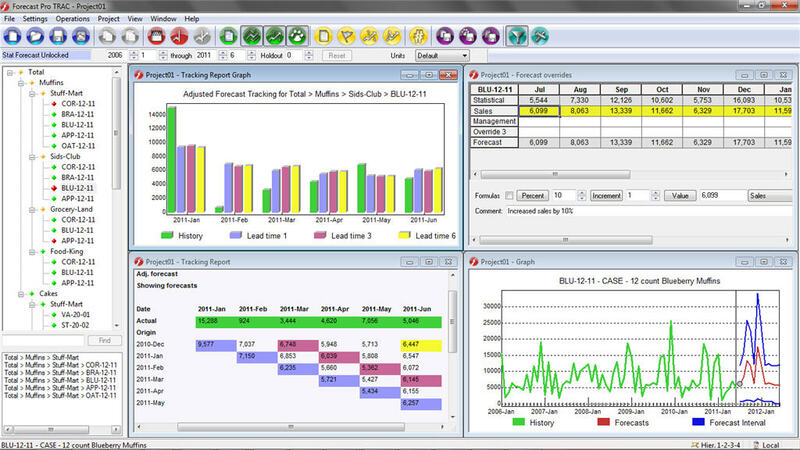 With just a quick glance at Forecast Pro’s "waterfall" reports you can zero in on what’s working and what isn’t. In addition to generating a statistical forecast, Forecast Pro allows you to import multiple forecasts into the forecast worksheet (i.e. from other parts of your organization or partners) and to specify which forecast serves as the "baseline" on an item–by–item basis. You can then combine multiple forecasts to create a new forecast consistent with your organization’s S&OP or other established process. 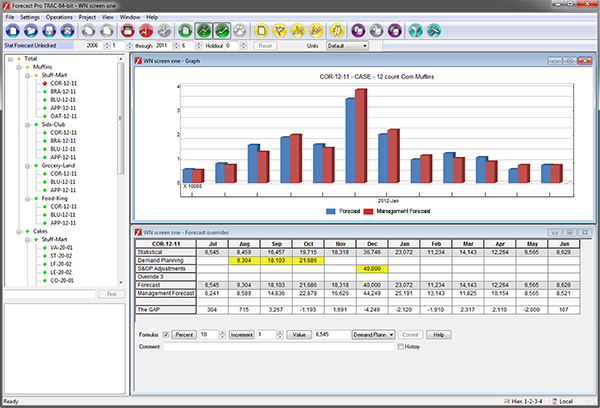 Forecast Pro allows you to bring other pertinent information into the forecast worksheet–such as current orders and inventory–and to create new rows which are calculated based on the values of existing rows (including forecasts and other imported information). You can then design customized planning and S&OP worksheets addressing your specific needs. Some forecasting processes require certain forecasts to be "frozen" or locked in for a period of time during which changes are simply not allowed. 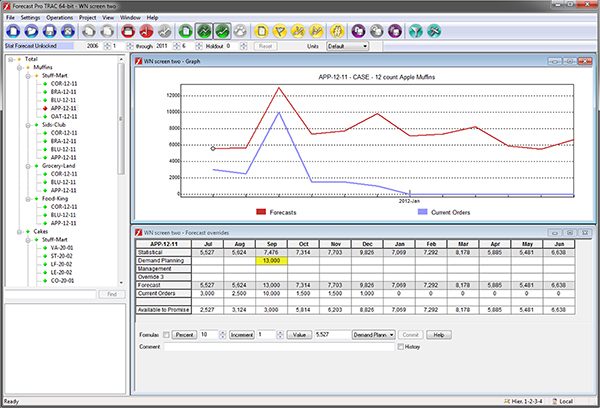 Forecast Pro allows you to set time fences–on a global or item–by–item basis–to prevent users from changing forecasts during these "fenced" periods. When you update a forecast project with next period's data and create new forecasts, the fenced values from the previous forecast remain locked in. Forecast Pro maintains "Forecast Projects" which allow you to easily update your forecasts from one forecast cycle to the next and to maintain a record of all your forecasting sessions.